After you’ve used our Coffee Maker Descaler, the last thing you want is for that perfectly brewed coffee to run thru a soiled coffee maker, and into a soiled carafe or thermos. Coffee brewers, carafes, and thermoses absorb the oils, tannins, and soil build-ups that accumulate from continuous brewing. Eliminate them with BKF Coffee Maker Cleaner! How can I get the stains out of my coffee maker carafe and travel mug? Over time, the naturally occurring oils, tannins, and proteins in coffee build up into stubborn brown stains on the inside of your coffee pot, carafe, or travel mug. In addition to unsightly stains, these coffee by-products add an unpleasant taste to your coffee. That’s why Bar Keepers Friend developed Coffee Maker Cleaner—a safe, effective way to get the stains out of your coffee maker carafe or travel mug while improving the flavor of your coffee. How can I clean my coffee maker without damaging it? Bar Keepers Friend developed our Coffee Maker Cleaner to target coffee oils, tannins, and proteins directly—dissolving and eliminating them without damage to your coffee maker or containers. Improve the look and taste of your coffee brewing experience when you learn how to clean your coffee maker with Bar Keepers Friend Coffee Maker Cleaner. Why should I use Bar Keepers Friend Coffee Maker Cleaner rather than regular dish soap? Regular dish soap isn’t an effective coffee maker cleaner. Dish soap can remove dirt and some odors, but doesn’t remove the root cause of coffee stains and poor flavor. Our Coffee Maker Cleaner formula breaks down and removes each component of coffee build-up. When you make Bar Keepers Friend Coffee Maker Cleaner part of your regular routine, your carafe and mug will look like new and your coffee will taste better than ever. Add one ounce Bar Keepers Friend Coffee Maker Cleaner for every eight ounces of COLD water needed to completely fill the coffee maker’s water reservoir. Do not exceed the maximum fill line for your reservoir. Leave the cleaning solution in the carafe for 30 minutes. Discard the used Coffee Maker Cleaner from the carafe or cup and clean the carafe or cup thoroughly. Add one ounce Bar Keepers Friend Coffee Maker Cleaner for every eight ounces of HOT water needed to fill your thermos or travel mug. Allow the cleaning solution to soak in the thermos or travel mug for 30 minutes. Discard the used Coffee Maker Cleaner and clean the thermos or travel mug thoroughly. NOTE: For stubborn deposits, manually wipe the surface clean immediately after soaking, prior to rinsing. Gloves and eye protection are recommended. Unintended splashing may damage appliance and countertop finishes. Always thoroughly rinse any object or surface that comes in contact with cleaning solution. Refer to your brewer’s manual for additional instruction before cleaning. FIRST AID: Keep away from eyes, skin, and clothing. If in eyes, remove contact lenses and rinse with water for 15 minutes. Do not ingest. If ingested, do not induce vomiting. Wash mouth out with water and call a physician if you feel unwell. Improve the flavor of your coffee by keeping your coffee maker, carafe, and travel mug free from stains and build-up. 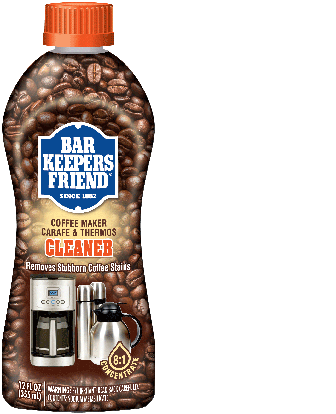 Ask your retailer to carry Bar Keepers Friend Coffee Maker Cleaner so you can enjoy your coffee’s best flavor.